A nine-point lead with a minute to go in the fourth quarter should have been enough for the Orlando Magic against a team missing its leading scorer. In a matchup of shorthanded teams with identical 10-21 records, the Magic let one slip away in losing 87-81 in overtime to the Cleveland Cavaliers. Even with center Nikola Vucevic sidelined because of a sprained left ankle, the Magic appeared to be in control after going on a 9-0 run to end the third quarter. 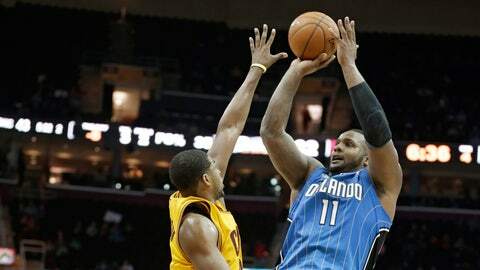 They never trailed in the fourth quarter and were up 79-70 after Glen Davis split two free throws with 1:04 to go. 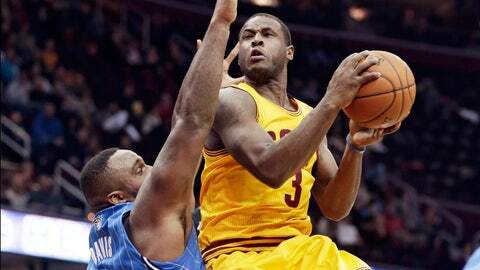 The Cavaliers forced overtime with a 9-0 run, then dominated the Magic in the extra session. But the Cavs, playing without Kyrie Irving (left knee bruise) for the first time all season, somehow overcame an atrocious shooting performance to force an extra five-minute period. Dion Waiters sent the game into overtime with a layup in the closing seconds, and other than a basket by Arron Afflalo, the Magic were blanked the rest of the way. Davis had 16 points and 13 rebounds before fouling out in overtime. Jameer Nelson finished with 14 points and nine assists, but all of that came in the first three quarters. Afflalo missed 10 of his 15 shots and was held to 12 points, his second subpar game in a row. Jason Maxiell filled in capably for Vucevic, playing a season-high 42 minutes and accounting for three of the Magic’s 12 blocked shots. The Magic are now 0-3 in overtime games, with all of those losses taking place on the road. The Magic fouled Jarrett Jack from behind the 3-point arc, were guilty of a five-second violation and saw E’Twaun Moore miss two free throws during the Cavs’ 9-0 run to end regulation. Anderson Varejao set a career high in rebounds with 25 and also nailed two jump shots in overtime to help the Cavs break a six-game losing streak. Anthony Bennett and Victor Oladipo, the top two picks from last year’s NBA draft, both went scoreless in limited action through three quarters. Oladipo finished with 26 points against the Cavs three weeks ago in Orlando but didn’t score until hitting a jump shot with 8:06 to go in the fourth quarter. Saturday night vs. Miami, 7 p.m. (FOX Sports Florida).